This is one of the finest Typhoons and well-documented vessels you will find. Kraken is no dry rot trailer trotter. 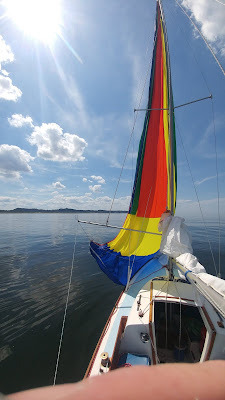 We sail her 1-2 times per week during the summer season. This boat has seen exceptional care since being re-commissioned in 2012. 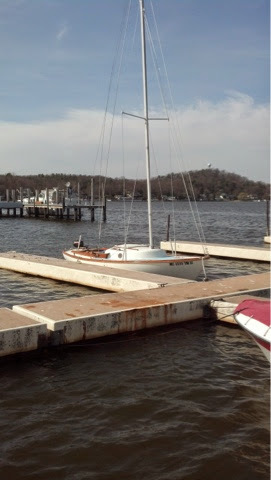 You can read all about the little tweaks and tunes at http://bristol-blue.blogspot.com/ Polished Brass and Gleaming Teak this boat gets compliments every time someone walks by on the dock. You will be hard pressed to find another Typhoon as well equipped and ready to sail today. 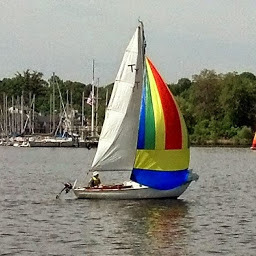 Each year in Saugatuck Cow Hill Yacht Club puts on Venetian Festival. Cow Hill is not really a club for boaters. It is a charity group that raises funds for the needy in the community. They Start Friday night with a big party. 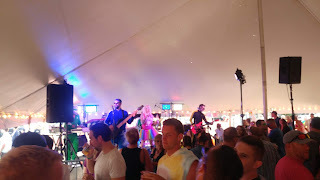 Kids games, Beer tent and some great live music. I'm proud to say that my wife serves on the board of Cow Hill and helps put this event together along with a few other events throughout the year. Saturday afternoon after the Venetian dingy poker run had cleared out we took to the harbor and headed out to Lake Michigan for a sail. Some days you have to just call it. Today is one of those days. We left our breezy little harbor for Lake Michigan to find this, the whole of Lake Michigan sheltered by the dunes on shore. Grr east winds. The lake was glass flat except for the power boat waves. After an hour of drifting and bobbing we had to call for the iron genny to get us home. Yesterday we were out and about. We met up with some friends at the beach then sailed back. We ran down with the spinnaker. Then after a few hours of beach fun we tacked back up the lake. Here is the funny guy I sail with crushing the MT Baldy Radar tower on the horizon. Captains log as we neared boat the sky opened up. 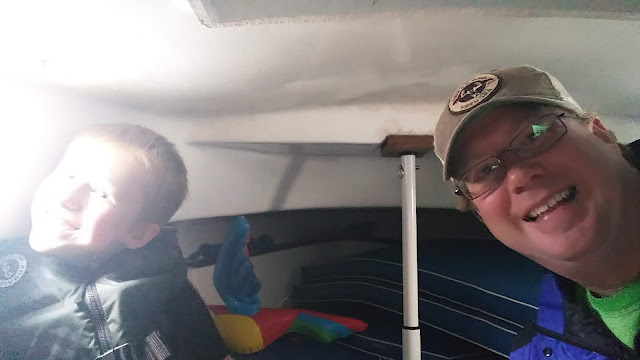 Currently taking cover in cabin... Perhaps we will stay at the dock today. BB was on the dock the other day as a friend and I came across the lake. She got some nice pictures of Kraken coming up tacking and heading back out. 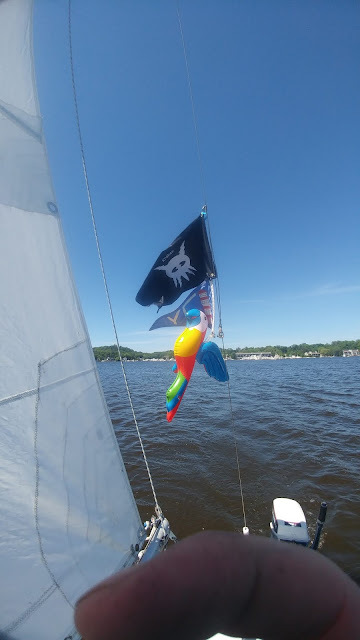 We made it out for a nice sail today. Check out the new flag set up on the backstay! The day after launch I got down before the rain rolled in. After about an hour I had Kraken's mast tuned in and everything rigged up. As I rigged up the boat I was watching the radar. Once everything was ready I checked the radar again. Looks like I have time for a quick shake down. The new running rigging is color coded. I know there are lots of opinions on how this should be done. I decided to go with white and red for all the jib controls and sheets. Blue and white line runs everything for the mainsail including the topping lift. 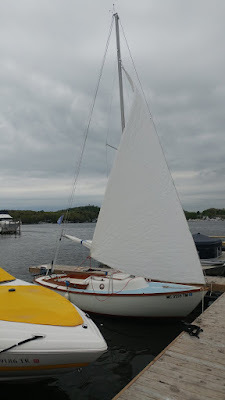 I think this should help out as Myles learns more about sailing this summer. 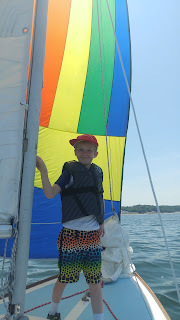 The spinnaker gear is all still pretty new but matching as well but I don't think will be teaching the kid about that yet. 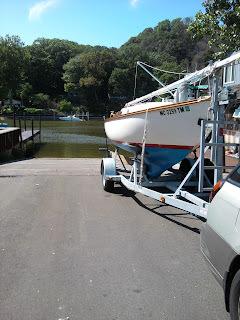 I made it back to the dock in time to put everything away before the rain. Love that radar app. Before I left the marina office 10 minutes later.it started raining. Hopefully Memorial Day Weekend will be nicer. It has been a few years since we've done a trailer launch but this year we decided with the how late it is into the season to go for it. No need to wait on the marina's schedule to get in the water. With all the rain and snow melt the water this year is super high. One would think this a good thing but it changes the slope of the ramp. Which means we had to back the car up a little more than normal. Things got a little damp inside the CRV this weekend. Our process for launch goes as such. First, we step the mast. This begins with setting up at the ramp site. I try to pick a day where the ramp will not be super busy as set up takes some time. We begin by untangling all the stays and halyards, then getting the uppers and backstay clipped into place. 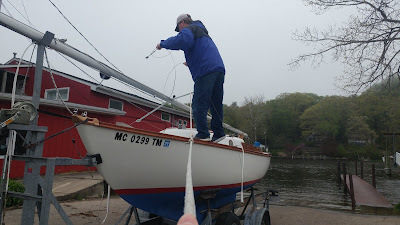 Then set up the tow-up rope to pull the mast up. 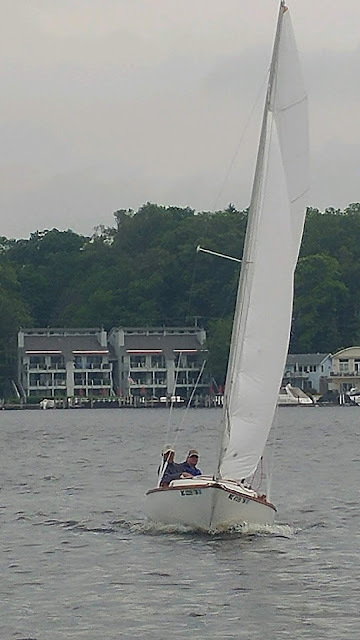 I do this using an old line and the jib halyard. 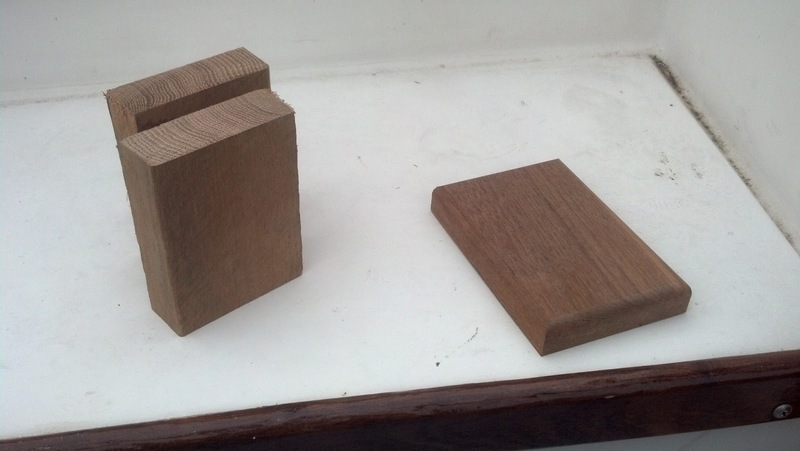 It has been a cold wet spring here and it is taking me a bit of time to get good weather windows for varnishing. 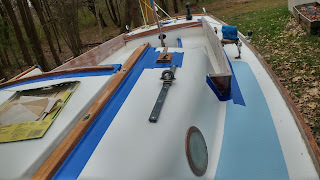 This year, with the boat next to my garage, I'm taking full advantage of the electricity and detail sander in my preparation phase. I've taken it back several layers and cleaned up some of the imperfections in the teak that have been gathering over time. Then the day comes when I could varnish. The trick is getting enough days in a row. The Epifanes takes 24 hours to dry before you can recoat. After 72 hours you have to scuff everything again so timing the weather is tricky. Last week the weatherman gave me a favorable window and it held. These were the easy ones to do in the garage. All set for the season. I also changed out the internal halyards and the sheet lines this spring.